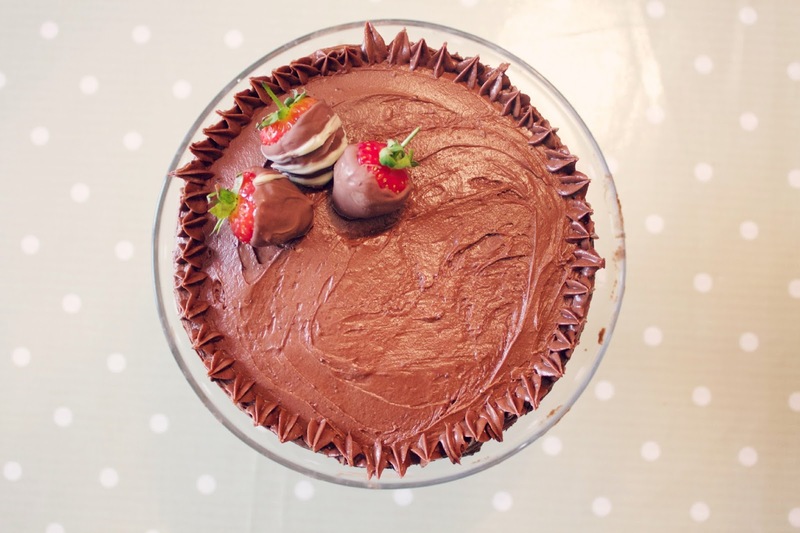 Here's my recipe on how to make the perfect chocolate cake! 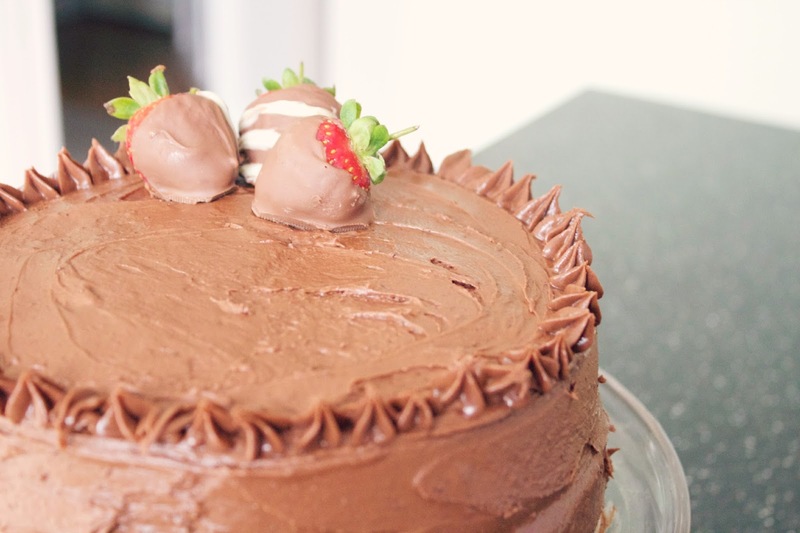 You can make this and only put frosting on the top but I really love how it looks when I completely cover it in frosting! 1) Pre-heat your oven to 180C and grease two cake tins. 2) Cream together the butter and sugar. This is how you get your cake light and fluffy, beat it together until you feel like your arm is going to fall off! If you only mix it a little, you will get a really dense and horrible cake! 2) Once you've done that, add the eggs and mix well. Once that's all combined, sieve the self raising flour and baking powder and gently fold in, don't stir this too much. Then add the Cocoa Powder, there's no specific amount, I just add it in until it's as chocolatey as I want it! 3) Split the mixture into two and put into the cake tins, pop it in the oven for about 20-25 minutes. 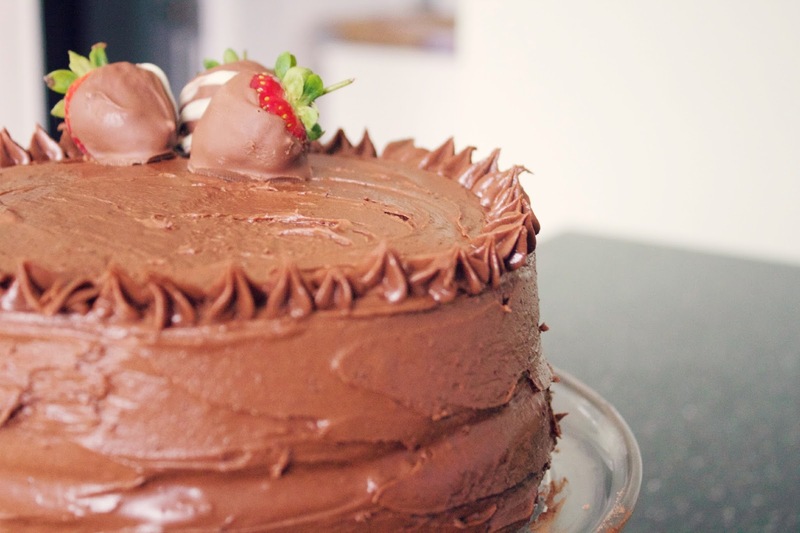 To test whether it's cooked, grab and skewer and push it into the middle of the cake, if it's clean, it's done! 4) Leave to cool and begin to prepare the frosting. Mix butter, icing sugar, cocoa powder and a dash of milk together into a bowl. Again, there isn't a specific amount, just try to start with a little bit of butter and more icing sugar and work from there, until it's nice and sweet. Just make sure it doesn't taste of butter. 5) Once the cakes have cooled, put some of the frosting into the middle and put the other cake on top. Then gently apply it to the rest of the cake, be careful as it will move around a bit! I then piped some extra details onto the top! I also dipped some strawberries in chocolate and used those to decorate! This tastes amazing and I'm so happy with how it turned out as this was my first time decorating it like this! Your cake looks delicious! I love the piping around the edges - my hands shake too much to create a nice, neat halo like you managed!